I received Lips as a Christmas gift and I thoroughly enjoyed this story. I loved the archaeology aspects of it and truly felt as if I were traveling with Elvis and getting to experience him firsthand. As others have mentioned, this story has a slight subtle 'twist' to it. I enjoyed that. The ending is a classic and the photograph is a genuine 'hoot.' It really does prove that the story is true. If you like reading books just for the pure fun of it, you will like reading Lips. When you finish reading Lips, you will put the book down and ponder, 'How did this author think of this?' I guess that's what makes authors authors — they are able to think of things like this. When the story begins, you have no idea that Elvis Presley is going to be involved in it. And yet, the way the author manages to pull it all together makes it seem as if it were the most natural thing in the world. I think Lips is a work of genius. Undoubtedly, it will be made into a movie. I know they will have to be careful in casting someone to play Elvis but they will also have to be careful to get the exact right person to play Arthur MacGregor. I completely recommend this novel. It is an entertaining read. After reading Lips, it actually felt like I had known Elvis Presley. It was like I had experienced the time that Arthur MacGregor got to spend with him. When the story was finished, I hated it because I could no longer be with Elvis. This is a truly nice story that is a lot of fun. But more than that, it gave me the experience of getting to know the real Elvis. I have already advised some of my friends to read this book. I'm sure they will enjoy it also. I was given a copy of Lips as a Christmas gift by a good friend of mine. I had never heard of this book before. It was a tremendously good surprise. I have always thought of myself as just a tad "quirky" and I found that aspect of this story to truly appeal to my nature. And yet, it is a sound story that would probably, as some of the other reviews have said, appeal to everyone. This is a book about Elvis Presley and yet, it is more than that. It is not just about Elvis but explores his humanity and, in doing so, explores the humanity of us all. It does this without being a serious and straight-laced book, but rather, a light-hearted story that is entertaining to read. I liked this book. I read "Lips" because I am a Byron Edwards fan. I have read "Dawn" and "The Mystery of Melissa's First Date" and found them both to be excellent reads. "Lips" is also. But I have read some of the other reviews about "Lips" and some of them would give you the impression that "Lips" is only for Elvis Presley fans. I have always liked Elvis but have never considered myself a fan but I truly enjoyed the story of "Lips." "Lips" if for everyone, not just Elvis fans. I like the writing of Byron Edwards because it takes you to the setting of the story. You feel like you are there in the action. His books are a little different than the normal novel but they are interesting. I wonder where he gets his ideas from. Don't ever think that you know what is coming up next in a Byron Edwards story or that you know how it will end. 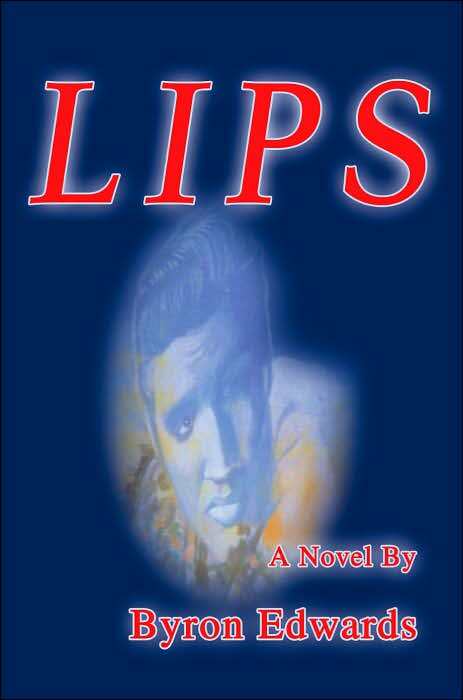 When you start reading "Lips," you haven't got a clue that Elvis Presley, of all people, will become a major character in the story. And when he does, you think you know what will happen and what the main character, Arthur MacGregor will say and do. But it goes much deeper than that and you wind up feeling like you actually got to know Elvis Presley as a person. I didn't anticipate that and, when the book ended, I found myself crying. I truly do think "Lips" is for everyone. It has very little and very mild profanity - much less than a teenager hears at school every day. In fact, I would highly recommend this book to teenagers as well as adults. My advice is to read "Lips." I'm sure you will enjoy it. Read about the Graceland Fence Photo!